Rule your mind, or it will rule you! It is easy to say, but how to achieve it? Maybe it is time to notice our brain work and reveal the possibility to change our inner world. Sometimes our thoughts pop up without permission, and some of them could bring peace and harmony, but some of them could get out us of control. Our mind could be our best friend, but also our worst enemy. If we miss calming our self, we can not get in order our thoughts or manage them. Where is the key to the peaceful mind? Is it possible to calm and control it? Do not wonder where is the clue, because it is under your nose. The answer is breathing - the basis of everything - our body, our health, and our life. One of the most important biochemical processes in the human body, which sustains it alive, and which is the entire connection between the mind, body, and soul. We can live without food or water for short time, but without air is enough only one minute to realize how important it is. Day by day, this automatic process fall into the background of our awareness and change our state of mind. All the time our consciousness is busy with thinking, and we almost forget to breathe. Fortunately, breathing could be under our control and do it consciously. New research found that the way of breathing may not only affect the amount of oxygen we take, it may also change our feelings and thoughts. Do you think about the way of your breathing? Do you breathe through your nose or your mouth, and how deep is this process? Every act of breathing is important for our health and it is necessary to be more vigilant about it. 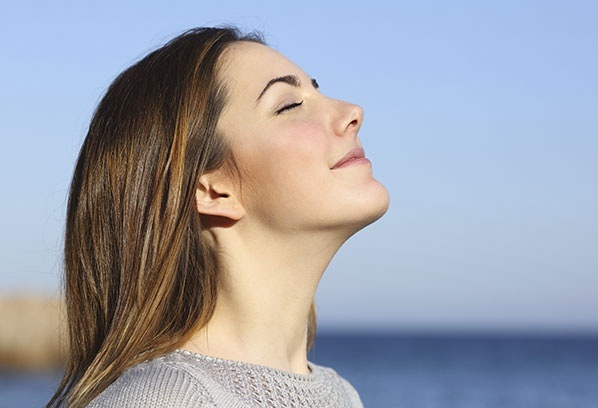 The proper breath can soothe our nervous system, calm the brain activity and blood pressure, improves immune, digestive system and concentration, etc. It is not enough to fulfill our mind with good and positive thoughts but also to create conditions for their growth. And the primary source of energy which controls the flow of life is the absorbed fresh air. By becoming conscious of this act and deepening it, we take our lives in our hands. Breathing techniques are the easiest way to strengthen our will, stimulate the brain activity and release the stress, get rid of all unhealthy thoughts, panic attacks, depression, etc. It is scientifically proven, only with the focusing on this important activity, can help the mind to forget about the unpleasant emotions and feelings. Try to concentrate on your breath for five minutes, and all negative thoughts will disappear. Breathing is the indicator of our inner harmony and our self- control, which also change our thinking and living. As deep and slow we inhale and exhale, as calm we are, which leads to a better mood and self-confidence. When we are worried and anxious our breath is shallow, which speeds up the activity of all systems in the body and get out of rhythm it. A long time ago, Japanese realize that the most powerful center of the life energy is in our belly, which is controlled by proper breathing. Even more, this is our psychic center - our second brain that consists of nerves and gathers all emotional waste. If we don't know how to throw it, we will suffer from imbalanced conditions. Today breathing techniques are used by professional psychologists, therapists and different teachers, healers, and guides to help the stressed people to release their suppressed emotions and tension. How to implement the technique? In the beginning, concentrate in your breath, listen to it and become aware of its deepening. How deep and fast you inhale and exhale? In standing, lying or sitting position, relax and put your right hand on the tummy, so to feel the rhythm of breathing. A few minutes later you should feel how your belly moves in the breathing rhythm. Deeply inhale through your nose, and blow out your belly, hold the air for a while and then slowly exhale through the mouth thus to gather your tummy inward. You can count till five while inhale and exhale the air to be in a rhythm. Repeat 5-6 times and make a pause, then leave the air to move freely. This experience will relax and balance your mind and body, which will evaluate your self-control. You can practice it every day, wherever and whenever you want. Rely on your breathing, because nobody can do this important activity instead of you, it is the easiest way to calm and control your mind.